Shuffleboard began as an indoor table game. In 16th-century England, people shoved coins down the length of a dining room table. As tables were also known as "boards," this game of "shove board" evolved into shuffleboard when weights, or pucks, replaced coins. The game became a staple of taverns. Shuffleboard's popularity actually increased during Prohibition when barkeepers replaced regular tables with shuffleboard tables. Yet it is to the great luxury liners of yore that the game of sidewalk shuffleboard owes its origin. The game that kept passengers happy aboard ship was soon pleasing resort-goers in Daytona Beach, Fla. The new version of shuffleboard spawned clubs and tournaments. St. Petersburg, Fla., became the center of competitive shuffleboard. Ordinary men, women and children, began to play their own brand of shuffleboard on sidewalks and streets. The sidewalk game consisted of a smaller court, or play area. It was also generally not permanent. Players drew the court in chalk. Everyday objects, like rocks and sticks, could replace more expensive professional equipment. A sidewalk shuffleboard court should be approximately 40 feet long by 5 feet wide. Outline the entire space in colored chalk. Draw a triangle at each end of the rectangle, beginning at the far end of the rectangle, and facing in toward the center of the rectangle. Each triangle should measure 8 feet from the base to the apex. Add another two lines inside each triangle, dividing the big triangles into thirds. 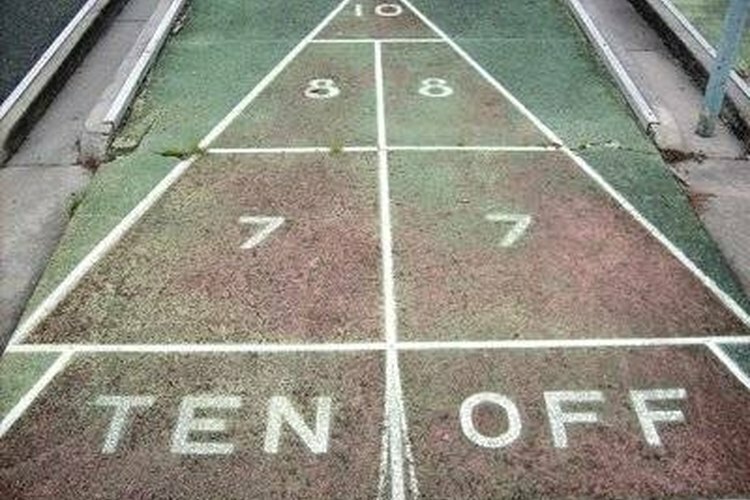 Write the number 10 in the small triangle at each end of the court, and place an 8 and a 7 in each of the sections below. Draw another line 3 feet beyond the apex of each big triangle, and straight across the rectangle. Next, add a shooting box just outside the base of each big triangle. Make this as large as needed to accommodate the size and skill of the players. The two boxes should be the same size. Gather up some flat rocks to use as pucks. Shuffleboard is played with two teams of two to four players each. Each team needs four pucks. Mark each set of pucks with a different color chalk to distinguish one team's pucks from the other's. Traditional puck colors are yellow or red, and black. Find some sticks that can be used to push the pucks down the court. Hockey sticks or broomsticks will work fine, though each will require slightly different skills. In a professional game, the yellow (or red) team goes first. Sidewalk players can flip a coin, or otherwise choose who goes first. The object of sidewalk shuffleboard is to push the rock (puck) as far as possible from the shooting box into the court. The rock must pass the second horizontal line on the court. Rocks not reaching that line are out. Scores are determined by the number in each of the boxes or triangles. Rocks remain on the court until both teams have played. The opposing team may try to knock the other team's rocks out of a scoring area, or off the court. A round is complete when both teams have pushed all their rocks. At the end of a round, add up the points for each team. Professional players compete for a total of 50, 75 or 100 points. The first team to reach the agreed-upon score wins the game.